Driving through Vermont is a scenic experience in any season, but the state's fall foliage is an international favorite. Visitors come to revel in the bright colors the trees display as they prepare for winter. Vivid scenes of mountains and trees can be enjoyed from either of the state's two highways or while navigating the back roads. Foliage typically begins to change in mid-September, and areas of fall color remain through mid-October depending on numerous factors including spring and summer weather, fall winds and rain and nighttime temperatures. Up-to-date fall foliage reports are available online throughout the season for Vermont and neighboring states. For many Vermonters, it is actually the post "peak foliage" season that offers the best scenic driving. Days grow short, and low-lying November light can almost create mirages through the open trees, illuminating rarely seen mountain views in cascading shades of brown and orange. Often referred to as "value season" by Vermont inns and bed and breakfasts, many lodging properties offer deep discounts in the latter days of October up until Thanksgiving. Some even extend these deals into the early part of December. Whether you choose the touristy peak fall season or the Vermonter value season, Vermont's Scenic Byways are an excellent place to start. Details of specific routes and their attractions and access to updated maps can be found at the Vermont Byways Program website. The Scenic Route 100 Byway truly begins when you follow Route 8 from Clarksburg, Massachusetts, north across the state line into Stamford, Vermont, or when you take Route 105 east from Newport and join Route 100 in the Northeast Kingdom. Arguably one of the most scenic routes in the state, it is also the longest—it takes well over five hours without stops to traverse the full length. Route 100 is thus divided into several shorter regional scenic drives between commercial centers where Vermonters conduct their non-tourism related business. The Green Mountain Byway runs from Waterbury on Route 100 north to Stowe and includes portions of Routes 100 and 108 farther north. The Killington Region's stretch of the Scenic Route 100 Byway runs from Ludlow north to Pittsfield. The Mad River Byway horseshoes from Middlesex Village on Route 2 south on Route 100B onto Route 100 in Waitsfield, then down to Warren and back north to Route 17 and up to the Appalachian Gap. The Connecticut River Byway on the eastern side of the state connects Vermont and New Hampshire via both shores of the Connecticut River. The drive winds from Putney north to Rockingham, using both sides of the river on Route 5 in Vermont and Route 12 in New Hampshire, with delightful stops in small river towns on each side. 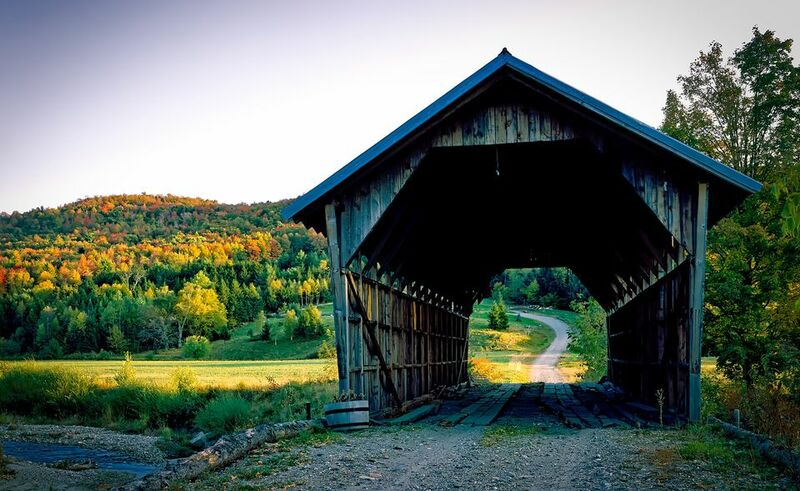 You can even drive across the longest covered bridge in New England —the Windsor-Cornish covered bridge spans the Connecticut River. The Molly Stark Byway connects the southern Vermont towns of Brattleboro in the East to Bennington in the West across Route 9, which is rural with the exception of the quintessential village of Wilmington. Another east to west scenic drive is the newly designated Crossroad of Vermont Byway. Follow Route 4 to crisscross the state between White River Junction and West Rutland, stopping in Quechee, Woodstock, Killington, and Mendon with a detour to the picturesque Jenne Farm if time allows. The Shires of Vermont Byway begins on Route 7 in Pownal after it reaches into Vermont from the Berkshires, and then connects with historic Route 7A in Bennington, continuing through Arlington and into Manchester Center. Here, it connects to the Stone Valley Byway, which takes Route 30 in Manchester through Dorset past Lake St. Catherine and up to Castleton, covering much of the ground of the state's slate and marble quarrying histories. The Lake Champlain Byway extends much of the length of Lake Champlain beginning in the North on Route 2 in the Champlain Islands and heading south to Route 7 near Burlington. Continue into the Lower Champlain Valley to Middlebury, where you'll have a choice of two distinct drives. Route 30 South past Whiting and then to Orwell via Route 73 loops onto Route 74 near the New York State border and back to Middlebury through Shoreham and some of Vermont's most glorious farmland. Route 125 into the Green Mountain National Forest leads through the wooded village of Ripton and over the Middlebury Gap onto Route 100 in Hancock. While not a designated byway, a crown jewel of fall foliage drives in Vermont takes you south on Route 100 from Hancock to the village of Rochester, then onto Route 73: the high road leading up and over the Brandon Gap with high cliffs, wooded roadside trails, and occasional moose sightings. Then, proceed down into the artistic village of Brandon. For another memorable fall driving experience, begin early with breakfast in Montpelier—Vermont's capital city—then head into the Northeast Kingdom via Route 12 or Route 14. When you reach Route 15, just keep going north, get lost, and find yourself in Vermont's backcountry with the most eclectic collection of small towns and country stores. Don't forget to bring a flannel...and a GPS. About the Author: Rachel Carter, our guest writer, is an entrepreneur and homesteader who works in Vermont's travel, agriculture, public relations and journalism industries.